In addition to the Top 25, Practice Greenhealth will recognize 379 health care organizations across 10 different areas of sustainability through its annual Environmental Excellence Awards program. * First time appearing on the Top 25 list. Top 25 winners range in size from large, urban, academic medical centers to rural critical access hospitals – but are all leading the country in addressing the links between the environment and human health – and have the programs and data to demonstrate their successes. These facilities have formal commitments to address climate change, are avoiding chemicals of concern and reducing meat served, have engaged staff supporting their sustainability programs, and show leadership in their local communities and across the health care sector. Award winners are chosen among hospital applicants that have the highest scores on the Greenhealth Partner for Change application. Each year, the competition for these top spots increases, as a growing number of facilities are implementing innovative, sustainable, and replicable practices. 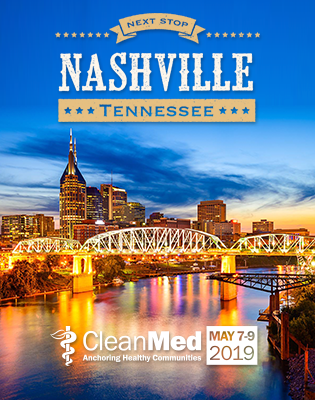 Practice Greenhealth will celebrate all of this year’s award winners on May 9 in Nashville at the Environmental Excellence Awards Gala during CleanMed 2019. These include the Top 25, the Visionary Leader Award, the Circles of Excellence, the Greening the OR Leadership Award, the Greenhealth Emerald Award, Partner for Change and Partner Recognition Awards, the Making Medicine Mercury-Free and Greening the OR Recognition Awards, and the System for Change Award. Learn more about all of the Environmental Excellence Award winners.